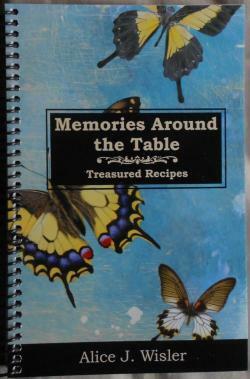 Memories Around the Table is a cookbook of treasured memories and recipes compiled by Alice J. Wisler. This is Alice's third cookbook of memories. She often asks those who have lost loved ones to contribute to her cookbooks. Her first cookbook, Slices of Sunlight, came out iin 1999; her second, Down the Cereal Aisle, was out in 2003. In Memories Around the Table, you will not only find favorite recipes, but the memories connected with each one. Learn to make strawberry cheescake, toffee, chicken divan, tomato sauce, fudge, garlic biscuits, peanut butter cookies and more! Each recipe (a favorite in memory of a loved one) comes with a memory written by a contributor. Published by Daniel's House Publications.